Splash pages, you gotta' love 'em. A blank canvas where the artist can take the brakes off their pencils and hit the reader square in the face with a large does of illustrated 'wow'. Writer Mark Millar's post-apocalyptic tale didn't just kick major heiny on every page, the spalsh page's which ended the majority of it's issues were somethin' else. 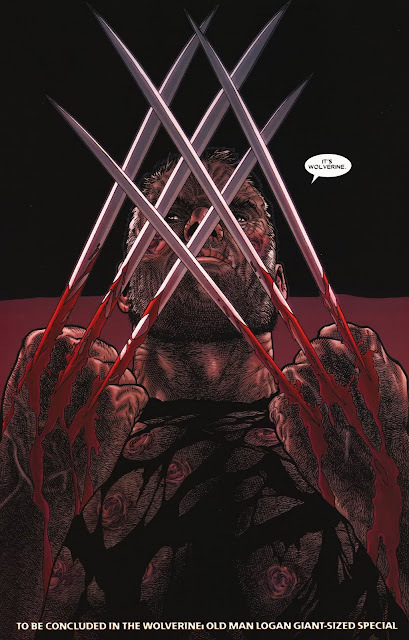 Here in Wolverine #72, after for most of the tale claiming 'Wolverine' was dead, 'Old Man' Logan accepts his former mantle when confronted by his family murdered at the hands of the Hulk and his gang. 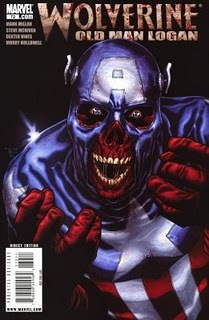 Artist Steve McNiven is one of those pro's who went 'boom!' during their time at CrossGen, and one look into Logan's gaze here proves it. Rock hard and icy, you know it's only a matter of time before those claws are Hulk deep in pay-back. That is a good one Dan..i remember when i first saw the page i was excited and sad at the same time. Excited because finally the claws popped up and sad because it was the last page and i had to wait for the final conclusion to see the result. It really reminds me of the Clint Eastwood movie Unforgiven. Clint, who used to be the baddest killer in the old west many years prior, spends 2 hours talking about how he isn't a gunslinger anymore. Finally when his friend gets killed he totally reverts to his old ways and murders a saloon full of bad guys. Of course, I didn't see the movie until AFTER I had read Old Man Logan, so maybe it's a type of homage. Kello - I think you are bang on actually - there are many scenes in O.M.L that read like that film, and even where Logan has that look about him, still when it comes off this cool I think both parties are winners on the day!